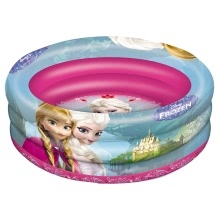 Keep cool this summer by splashing around in this Mondo Frozen Swimming Pool 16527. It is suitable for children from 10 months. Keep cool this summer by splashing around in this Mondo Frozen Swimming Pool 16527. This pool has a hard-wearing vinyl bottom, which makes it very durable. The wall and the bottom of the pool are decorated with Frozen prints, which makes the paddling pool extra appealing for the little ones. It is suitable for children over 10 months.